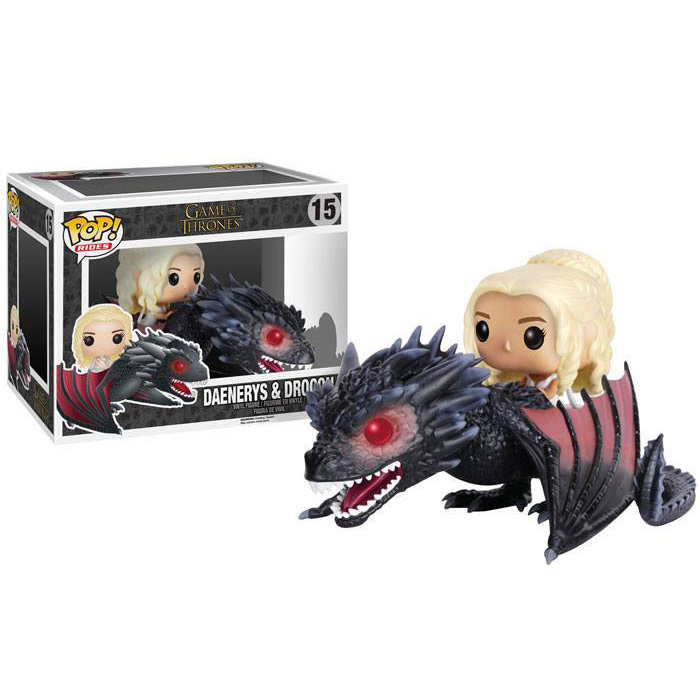 Are you interested in the Daenerys with Drogon (Game Of Thrones) Funko Pop figure ? Daenerys is one of the main characters in the series Game Of Thrones adapted from the novels by George Martin A Song Of Ice And Fire. Game Of Thrones takes place in a fantastic medieval world where several families struggle for power on the continent of Westeros. On the other side of the sea, Daenerys, the last descendant of the previous king, struggles to survive and rebuild an army to regain the throne. By the end of the first season, the dragon eggs that had been offered to her hatch even though the race was believed to be extinct and the eggs were believed to be mere fossils. Thanks to the slave army that she will release and make adhere to her cause, Daenerys will take control of the city of Meereen and temporarily settle there. She will try to put it right after releasing all the slaves but when she is attacked by the old masters, the dragon Drogon,who has grown well, comes to save her and takes off with Daenerys on his back. 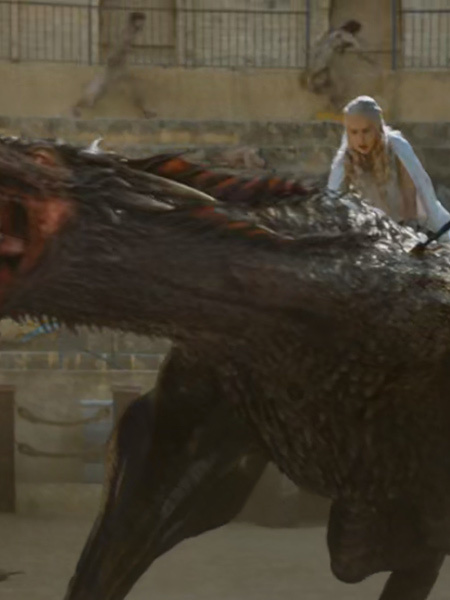 Drogon is one of the three dragons that come out of the eggs at the end of season one. He is the black dragon, biggest and fiercest that Daenerys named in homage to her husband Drogo who died just before their birth. 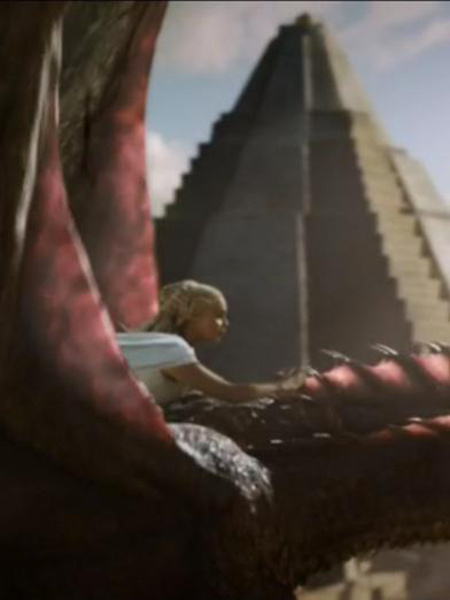 Drogon is shown depicted on the ground wings spread to let Daenerys climb on his back. His mouth is open to reveal his impressive teeth and his eyes are red to add to his fierce look. The details of his scales and thorns on his head and his tail are very finely reproduced. 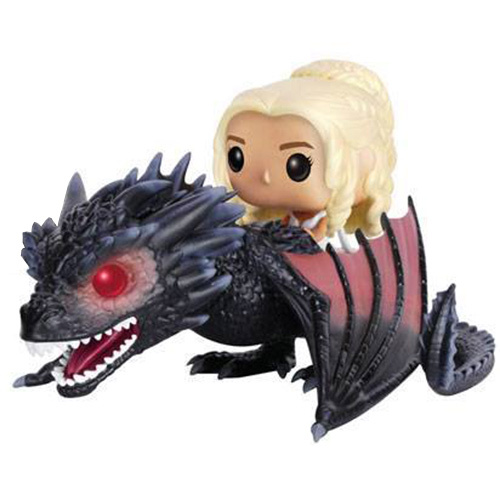 Daenerys is placed on his back and her figurine is also finely detailed. We can see the white dress she wears when Drogon comes to save her. Finally, her face is quite simple but her hairstyle made up of several mats and a chignon is very nicely reproduced.